UFO SIGHTINGS DAILY: Meteorite extracted from hole in Argentina, Sept 2016, Video, UFO Sighting News. Meteorite extracted from hole in Argentina, Sept 2016, Video, UFO Sighting News. This is an awesome find in Argentina. This meteorite was found this week and fell about 4,000 years ago. Made of iron and nickel, its extremely heavy, which makes it near impossible to burn up in the atmosphere as it falls. Meteors like this pass Earth every day, some of them are 20-100X its size, but most pass the distance of our moon, while others pass between Earth and our satellites in orbit. Makes you wonder if the NEO (Near Earth Object) gov organisation will tell us or not if a big one is about to come. Some meteorites are so big they need a name. 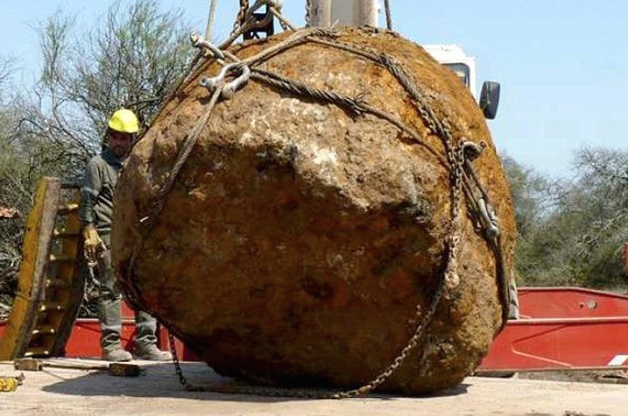 Meet the Gancedo meteorite, a gigantic space rock extracted from the ground over the weekend using heavy machinery. It was found near the village of Gancedo in Argentina in an area known as Campo del Cielo ("Field of Heaven"). Campo del Cielo is rife with iron meteorites estimated to have fallen around 4,000 years ago. What makes Gancedo unusual is its massive size, with a weight estimated at around 68,000 pounds (31,000 kilograms). News organization Compacto Nea posted a video of the meteorite extraction on YouTube Monday. It was a complicated affair requiring excavation equipment, chains, cables and plenty of heavy lifting to remove it from its impact crater. Parts of the iron meteorite have a rusty orange hue. The largest meteorite ever uncovered sits in southern Africa. The Hoba meteorite is estimated to weigh more than 132,000 pounds (60,000 kilograms). It's so big, it hasn't been moved and is now a tourist site. Argentinian news source Norte says the Gancedo meteorite is the second largest ever discovered.